Vegan recipe that replaces eggs with flax eggs! This cake is moist, flavourful and great for an afternoon coffee break or get- together. Preheat oven 325 °F (160 °C). Liberally coat a nonstick bundt pan with cooking spray and set aside. Whisk together the ground flax with 1/3 cup (75 mL) water and let stand for 2-3 minutes. Drain the pears, reserving the juice. Add enough water to the juice to equal 1 1/3 cups (325 mL) liquid. In a large bowl, combine sugar, oil, and vanilla. Using electric mixer on medium-high speed, beat until well blended. Add flax mixture and 1 1/3 cups (325 mL) liquid, beat until well blended. Reduce to low speed, add flour mixture, beat until just combined. Stir in zest. 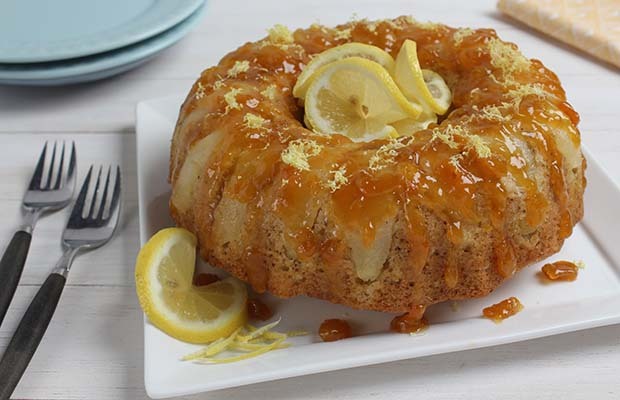 Arrange the pear slices in the bottom “grooves” of the bundt pan, carefully pour the batter evenly over all. Bake 1 hour or until wooden pick inserted in the center comes out clean. Transfer the cake in the pan to a cooling rack. Let cool 30 minutes. Gently run a knife around inner and outer edges of bundt pan and invert onto a serving plate. Let cool completely, at least 1 hour. Heat the fruit spread in a small saucepan over medium heat until slightly melted or place in a microwave-safe bowl and heat on high setting in microwave for 30 seconds. Brush lightly over the cake.